Clean, neat, and making the wearer look respectable are the things why many medical professionals still demand for white medical uniforms. This is despite the fact the colored and print scrubs have already penetrated the health care industry successfully. Also, knowing that trusted manufacturers like Dickies keep bringing quality white medical uniforms, customers will continue patronizing the products. 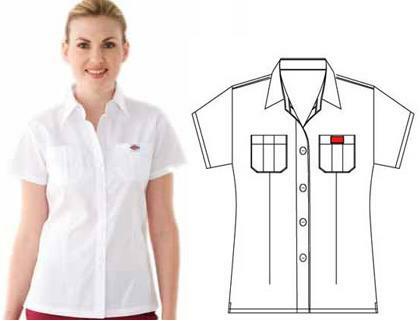 A Dickies uniform design such as the one in the above picture, maybe plain and simple; but this shirt is definitely perfect for a tiresome occupation in a hospital. It has breathable weaved fabric that keeps the wearer comfortable; short sleeves which make it even more comfortable; two chest pockets to store some valuables; a Johnny collar sitting properly on the top for a modest look; and a snap-front for convenient garment changing. More can be expected with other Dickies uniforms. More from white scrubs. 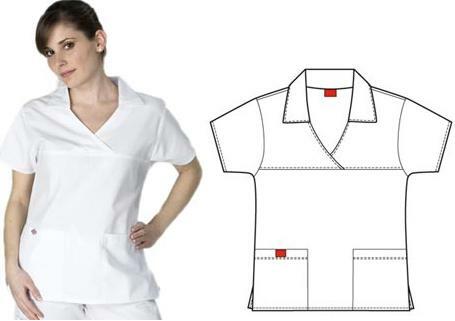 As you browse on, checking for more white Dickies medical uniforms, the more fashionable designs will surely entice you. One beautiful design is the Dickies Johnny collar top. Its cross over v-neck highlights a style that is both elegant and simple. The vents and short sleeves balance comfort with snug fitting in mind. The oversized patch pockets, although opposing the upper design, are necessary at keeping a true Dickies scrub uniform look. To see more of Dickies scrub uniforms, and be able to choose the design that’ll suit you best, simply visit Pulse Uniform. This online store carries wide line of Dickies medical scrub tops, scrub pants as well as lab coats to make shopping convenient and hassle free for the busy people in the medical industry. Also discover in that site great discount prices on every Dickies product.